Nope, I'm not swearing at you--this is the name for a delicious, peasant-style salad from the Middle East. It's healthy, inexpensive, and simple to make. 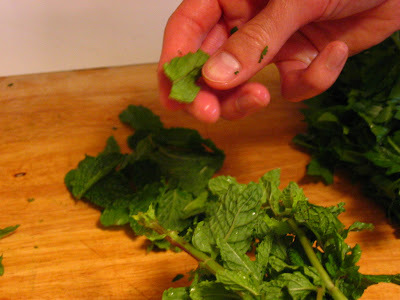 The ingredients are all things you can easily find in your local grocery store--or even grow in your backyard for that matter--so it passes the five easy questions test quite easily. You'd think there would be nothing special about a salad made from the plain-jane list of basic ingredients below, but once you combine everything, you'll find that you've created an unmistakably exotic dish. I hope you enjoy it as much as we do. 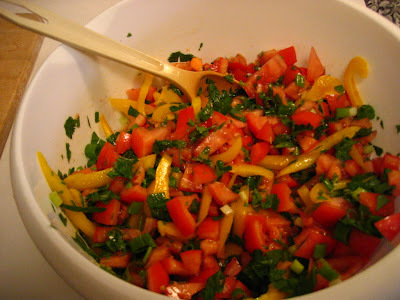 1) Coarsely chop the pepper, cucumber, tomatoes and scallions and place them into a large salad bowl. 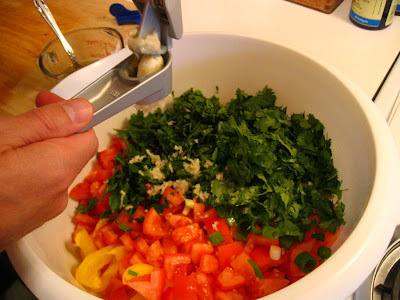 Use a garlic press to add in the garlic. 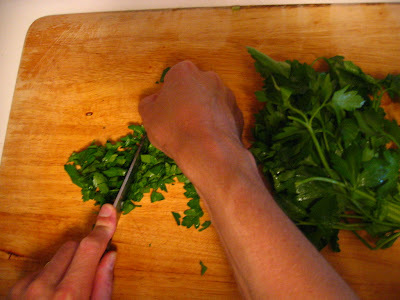 Add in the chopped parsley, cilantro and mint (note: you must use fresh parsley, cilantro and mint here... dried greens here just will not get the job done). 2) To make the dressing, combine the olive oil and lemon juice and season liberally with black pepper (and if desired, crushed red pepper flakes as well). Pour over the salad, reserving any excess dressing, and toss well. 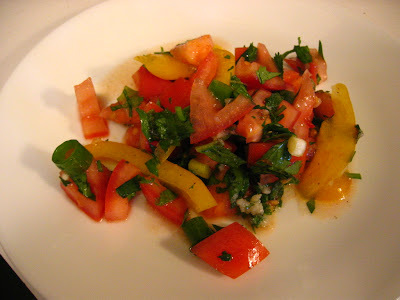 3) Serve with optional pita bread or as a standalone salad. Serves 4-5 easily. Laura took some beautiful photos of the ingredients and process as I was making the dish, so I'm going to take advantage of her talents and show you a bit of a pictoral how-to in this post. Let me know if it's helpful to you! 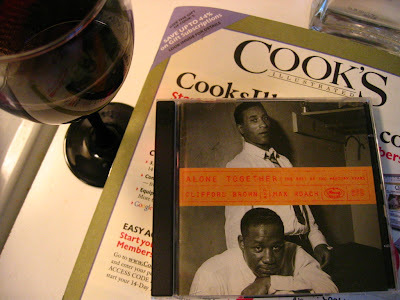 First off, whenever you are cooking, it really helps to have some good music playing and a glass of wine within easy reach. Helps ease the pain. 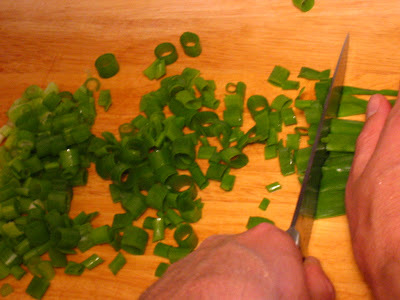 Using a garlic press will save you a lot of time in this recipe. The garlic really infuses the entire salad. Delicious! ...and then serve and enjoy!! 1) The dressing is oh-so-simple to make and laughably cheap--why not make a big batch of this and use it on other salads too? I'm wondering now why I even buy regular overpriced salad dressing at the store. 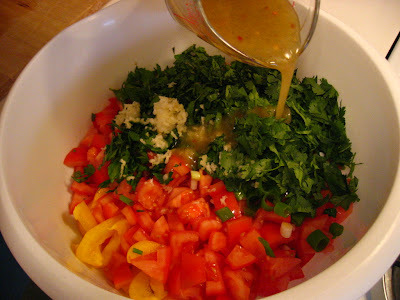 2) This salad will keep well in your fridge for a week (the lemon juice acts as a preservative). 3) Another strength of this dish is its flexibility. The last time we made it, I totally flaked and forgot to buy the cucumber. It didn't matter, the salad still turned out great. 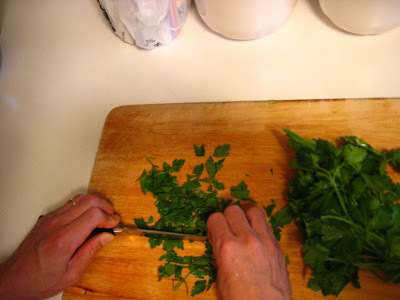 Just don't try and leave out the fresh parsley or mint, as those are probably the two most important ingredients because of the smell and flavor they impart to the dish. 4) Sorry about a bit of extra prep work here, but it's well worth it, believe me. I encourage you to try and find a way to outsource it if you can. The pictures really add to the appeal of the recipe. Well done. I'm curious does the recipe originate from Sunni or Shiite. Will you get a fat tush if you eat too much? Looks good. On the dressing, are you using a juicer for the lemons? and if you forgot to buy lemons and you have to resort to the plastic green bottle, how much should you use? and would you provide a ballpark amount on the black pepper? 2) Re the origins, I actually have no idea. I don't think this is a Sunni or Shiite kind of thing though. 3) Re the lemons: I didn't use a juicer, I just squeezed (squoze?) the lemon over a pasta strainer to separate out the seeds. And if using bottled lemon juice I'd use about a quarter cup. 4) Re the black pepper: I used a generous half teaspoon of black pepper and four or five shakes of crushed red pepper. It came out great, not too spicy. I couldn't agree more with the "music and wine" theory. I cook for a (threadbare)living, and love it, but when I get home and cook,with the aforementioned accompaniments, I LOVE it! Thanks for your comment. If only they would let you drink on the job, right? Nothing like some great jazz and cheap (in my case anyway) wine to make life worth living. i made this and didn't eat until the next day. it was good but there was a lot of liquid, i would compare it to a cold stew. is it supposed to be like this? You kind of have to eyeball the ratio of liquid to veggies and herbs in this dish... I'll make a note of that in the post. It's also possible that sitting overnight leaches some more moisture out of the veggies as well. Just guessing on that though. Finally, you can certainly pour off the excess dressing (and reuse it too) until you have a ratio that you're happy with. What really makes fattoush are two ingredients not listed: lightly fried pita bread bits (my understanding is that fattoush means bread salad), and the spice sumac (easy to purchase online and good for seasoning meats and other things). I'm sure your recipe is still tasty, though! What does religion got to do with a food? How stupid can you get???? Fattoush is Fattoush wherever you go in the Middle East. It's like asking asking someone if the 'Irish Stew' is Catholic or Protestant recipe. Thank you for sharing the recipe, let's enjoy the food without ignorance.